Trolleys, scooters, Uber and now an expanded free Freebee ride are all part of the Grove experience now. Freebee is a free ride service which you have probably seen around the village. They operated mostly in the Center Grove since March but now they have expanded their route and their hours. They will start to operate 7 days a week. They now run from Coco Plum circle to the South; Le Jeune to the West and Alice Wainwright Park to the North. See the map below. In a few weeks, the service will also be offered daily. 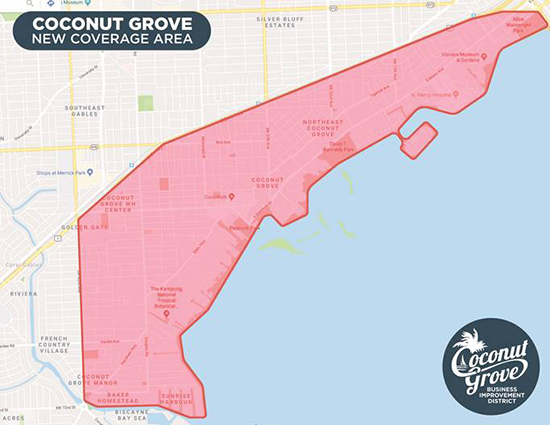 Riders can request on-demand door-to-door transportation to and from the Grove. The program is funded through advertising. You can hop on at any place or download the app and summon them for free. They are also Grove Ambassadors who will recommend places to visit or places to eat in the Grove. I tried to use the Freebee app to call for a ride into the Grove from my house in Bay Heights. No driver responded. I waited 10 minutes for a response from a driver that never came.